I’m still alive guys, I promise! Since my last post I moved, started creative ad classes, and have taken on a lot of new responsibilities at work. Moving and the early sunsets made cooking and shooting with decent lighting impossible, but I have no excuses now that summer is here. Post-move, the only thing I miss is the Whole Foods down the street. I missed it so much I stopped by the other day to pick up coffee (our old store roasts their beans in-house daily). I found myself gazing intently at a wall of produce. Sure, why not. Kale is healthy. Plus, I just saw Jurassic World. Perfect. So I grabbed a bunch of the dino kale. 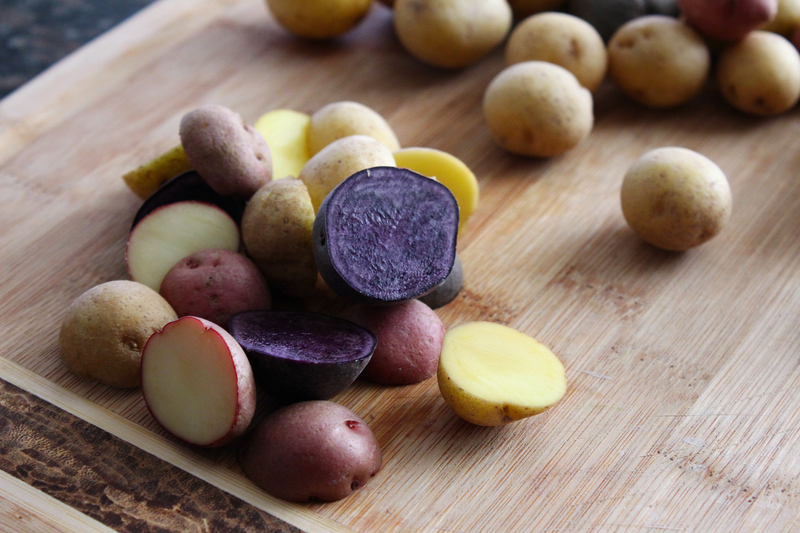 Then I picked up a bag of tiny purple and gold potatoes because they were adorable- I would figure out what to actually do with them later. The next day I bought some salmon at Trader Joe’s. And that is how this yummy meal came to be. 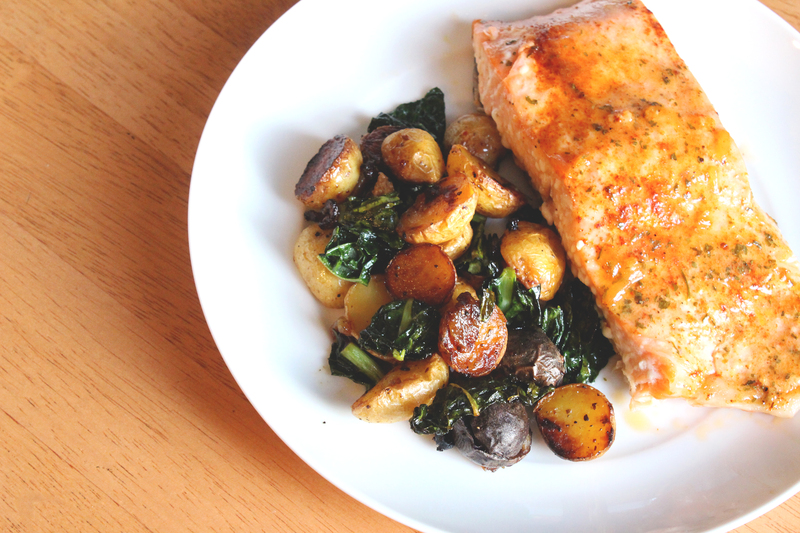 It takes less than an hour to make, is comprised of only 4 main ingredients, and is delicious. It’s probably not the healthiest but it’s a start! 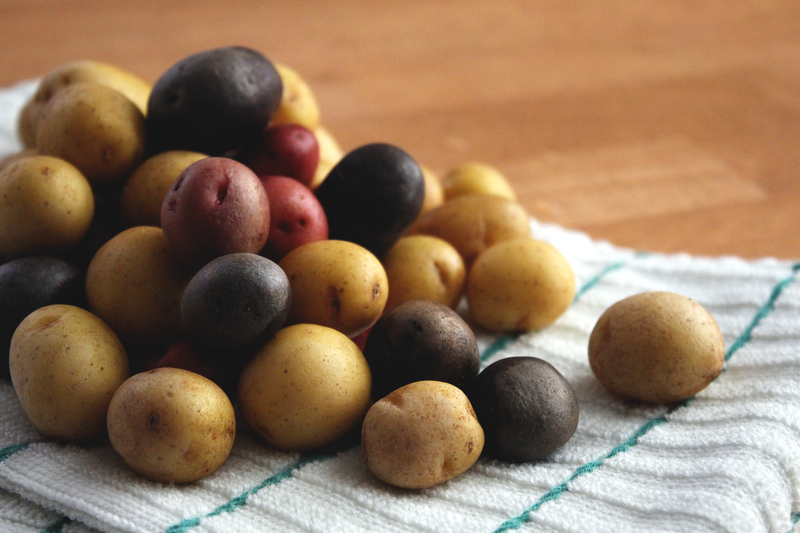 First, wash and cut your tiny potatoes in half. Wash and chop up kale into 1 inch pieces and set aside. Chop up onion, and throw into a small bowl with the potatoes. 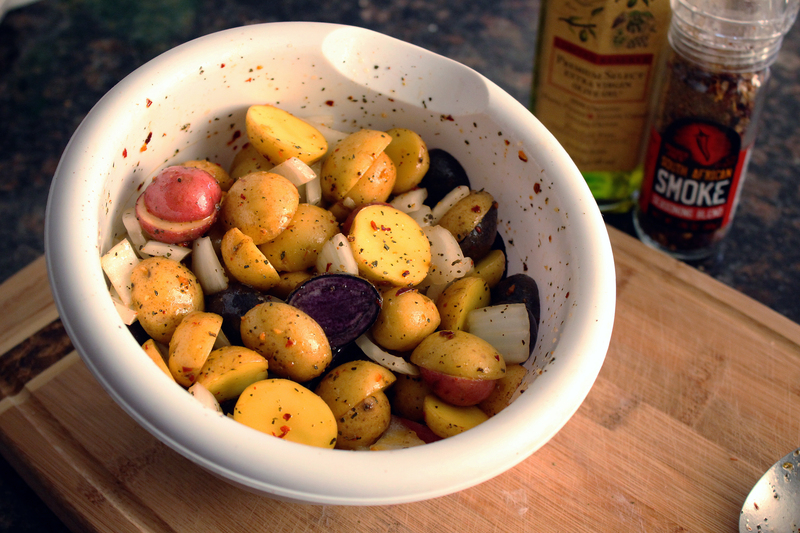 Toss in olive oil, and season with salt, pepper, and smoked seasoning until it looks like this. Preheat the oven to 375 F. and grease the bottom and sides of a small broiler-safe casserole dish. 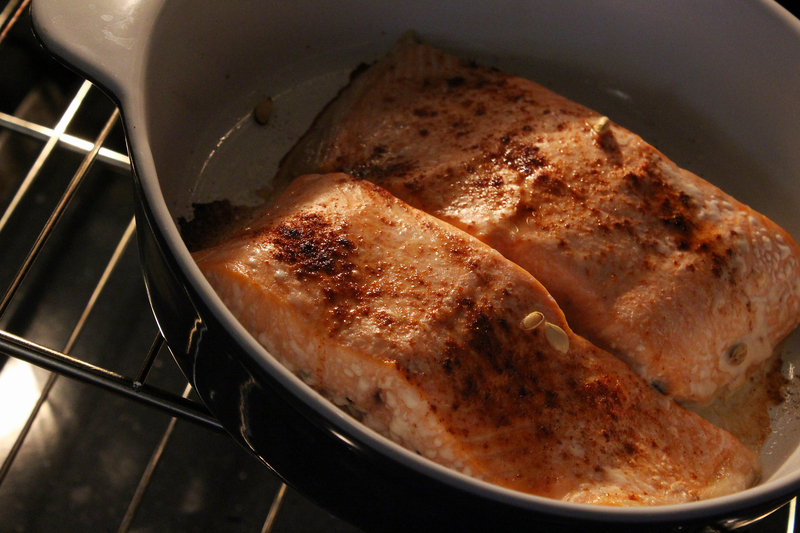 Season the salmon with salt and paprika and place into the dish, skin side down. Bake in the oven on the middle rack for about 15 minutes. Heat pan on high. 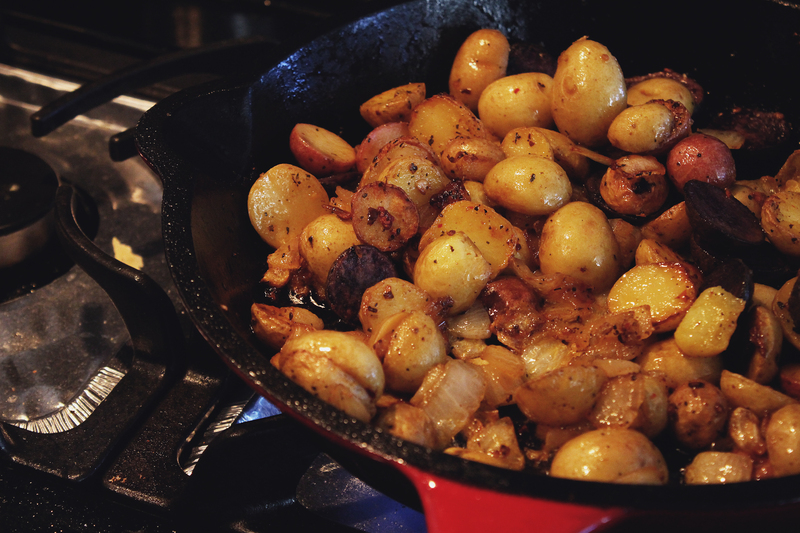 I love using my cast iron skillet because its ability to get super hot and maintain that temperature is great for getting potatoes brown and crispy. Add vegetable oil to pan, making sure it’s evenly coated. Start cooking the potatoes on high for about 15 minutes. Stir every couple of minutes, scraping bottom of pan and browning the potatoes on all sides. 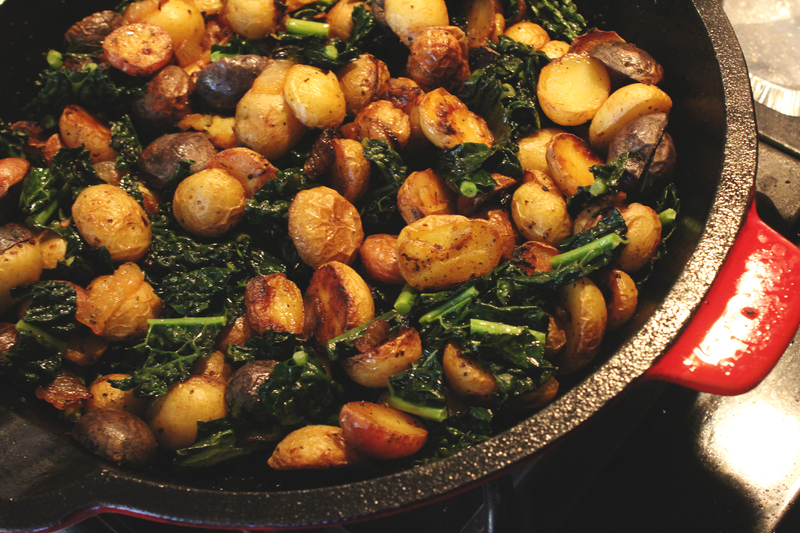 Mix kale into potatoes, cook until wilted. Turn off burner and set aside. 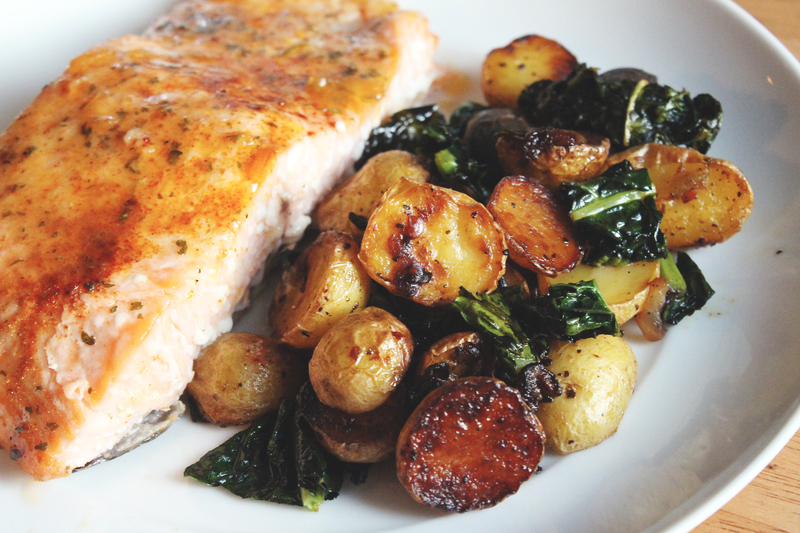 When salmon is just about done, and looks kind of like this, remove from oven. 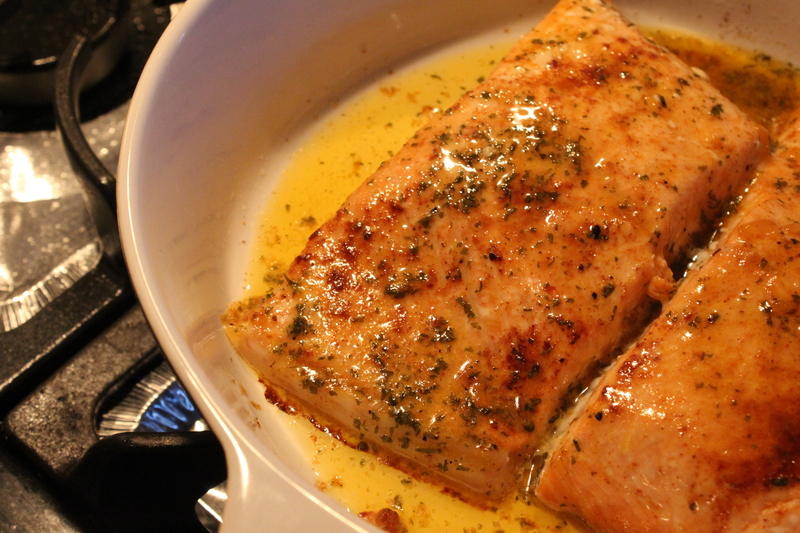 Squeeze half a lemon over each fillet and spread butter evenly over both fillets. Broil on high for about 3 minutes (still on the middle rack), just enough for the butter to melt. Thanks for liking a post on my blog! I love the fact that you buy veggies because they’re cute. I do the same. This looks amazing. Def will try it out.